This fully updated second edition of Medical Billing & Coding For Dummies provides readers with a complete overview of what to expect and how to succeed in a career in medical billing and coding. With healthcare providers moving more rapidly to electronic record systems, data accuracy and efficient data processing is more important than ever. Medical Billing & Coding For Dummies gives you everything you need to know to get started in medical billing and coding. This updated resource includes details on the most current industry changes in ICD-10 (10th revision of the International Statistical Classification of Diseases and Related Health Problems) and PPS (Prospective Payment Systems), expanded coverage on the differences between EHRs and MHRs, the latest certification requirements and standard industry practices, and updated tips and advice for dealing with government agencies and insurance companies. 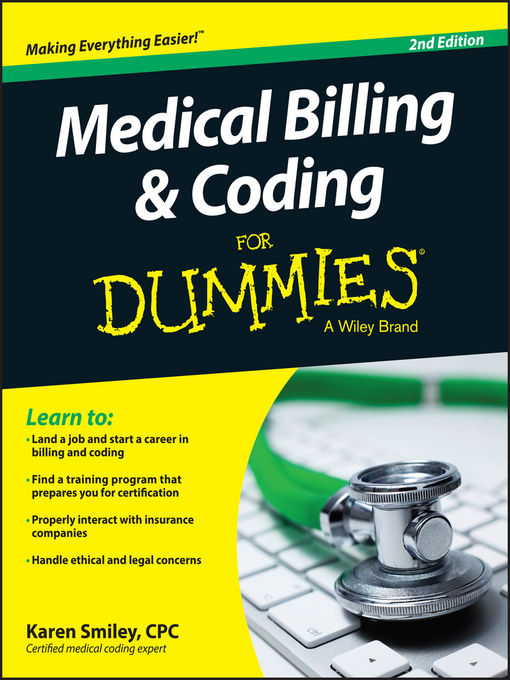 Medical Billing & Coding For Dummies, 2nd Edition provides aspiring professionals with detailed information and advice on what to expect in a billing and coding career, ways to find a training program, certification options, and ways to stay competitive in the field.